A simple pattern and yet one that can look so good when used for transport seating that needs a restful ambiance. Not all patterns need to be complex and it’s knowing what to use to create the right atmosphere. Once again, I like the small repeat and the simple but direct colours and I think this would find an equally good home as a general furnishing fabric. Again, this pattern was created using the excellent Filter Forge software with, for this pattern, the Fun Shapes filter by Ravi Rajcoomar. For a change from transport fabrics, we have a wallpaper and this design echoes strongly the early part of the 1950s in the UK. For best impact, I have shown it on all the walls just as it would have been used at that time. There are two colours shown here and you and see at once just how different the room looks with a change of background colour. 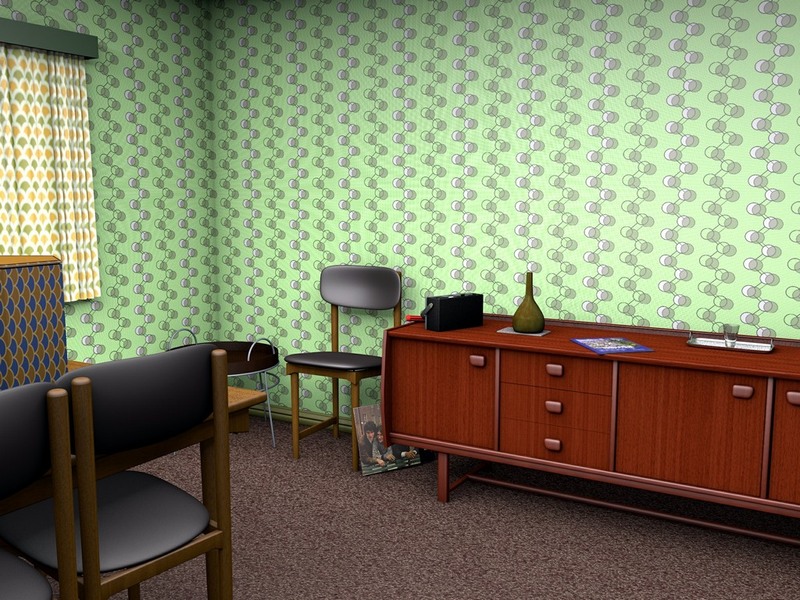 This is a great wallpaper that would do well today in a modern setting and using perhaps more modern colours. 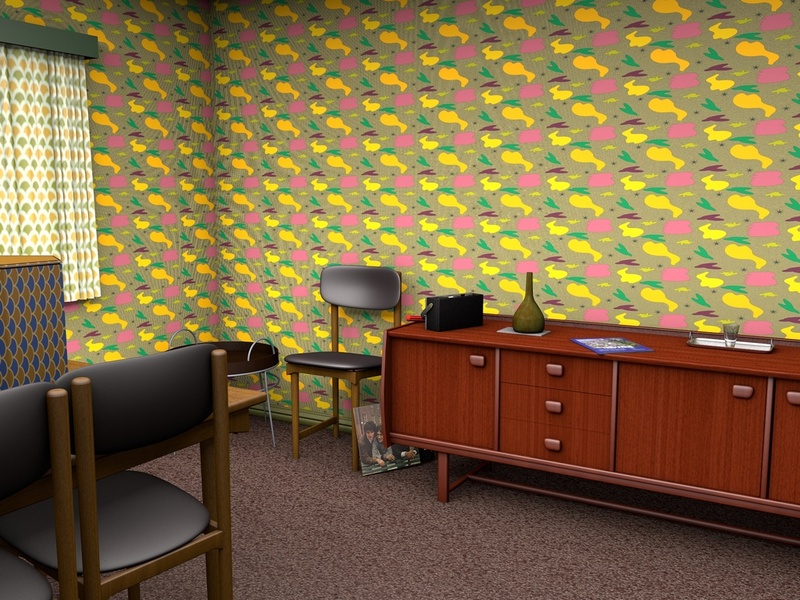 It was created in Adobe Illustrator and the image was produced using my period living room in Cinema 4D. 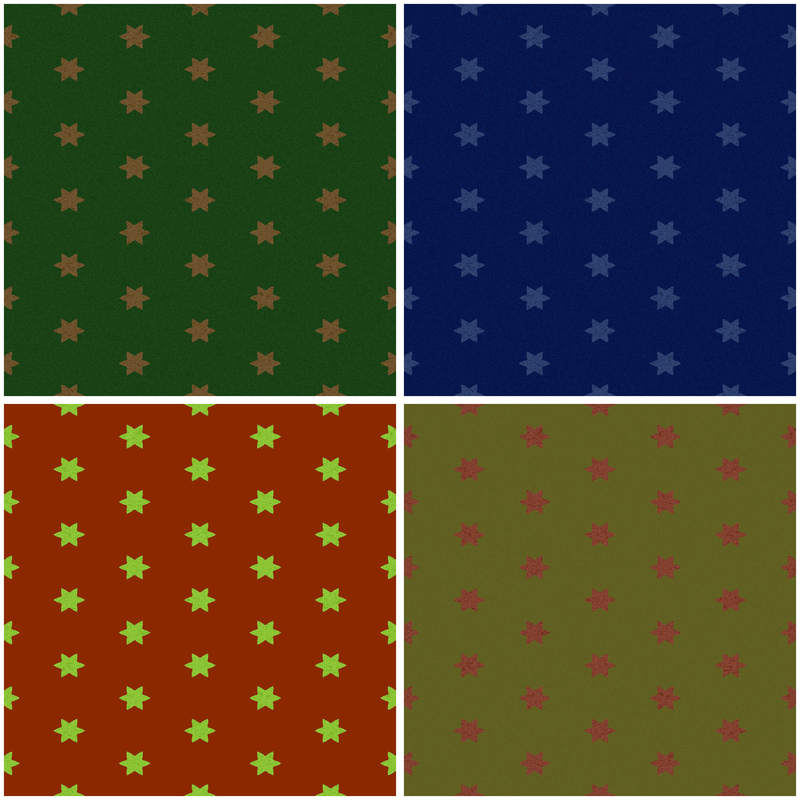 More transport patterns, this time using a very simple but effective pattern of stars. I have to say that this is a pattern I like for it’s pleasing shape and small repeat. Again, this pattern was created using the excellent Filter Forge software with, for this pattern, the AL_PatternMaker 1 by Lorenzen. Another composite of four patterns, again in four different colours, but this time of a more whimsical nature but still intended to be used as seating fabric for bus, coach or train. As I said yesterday, designs for public transport fabric needs to be inconspicuous and not too colourful. These designs are exactly that, flat, seemingly uninteresting colours, but enlivened by a cute and humorous design that lifts the fabric and makes for a more interesting transport experience for the user. Remember that, often a transport user experiences a fabric pattern only for a short time and so more striking patterns are allowed. This pattern was created using the excellent Filter Forge software with, for this pattern, the AL_PatternMaker 1 by Lorenzen. This is a composite of four related-by-colour patterns intended, eventually, to be transport patterns for the seating fabric of either bus, coach or train. Patterning for transport needs to be inconspicuous but that does not mean it should be boring. 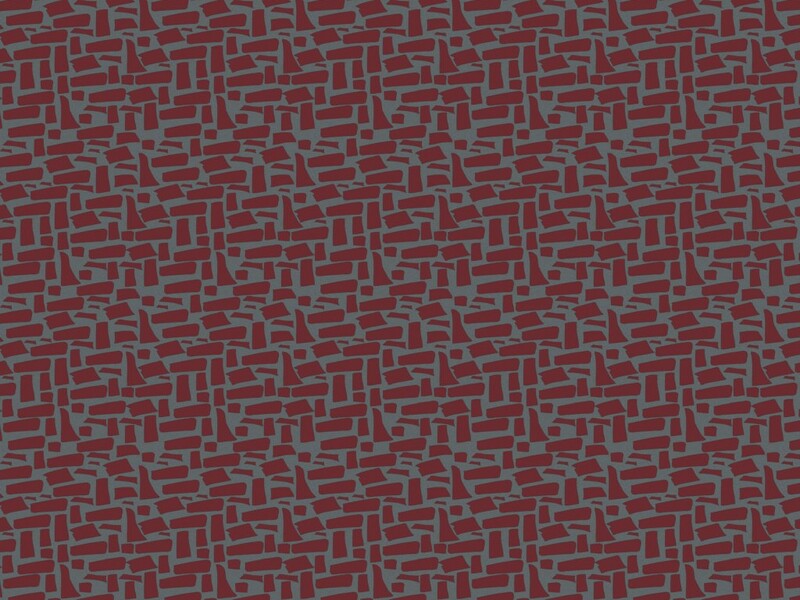 This pattern is the first of new series I have produced that use some of the best elements of older, mid-century designs incorporated into a modern framework. Their intended use is for public transport and I will, over the course of this year, be incorporating them into 3D models of the appropriate public transport vehicles. The patterns were created using Filter Forge software, the particular filter used for this pattern being Fabric Frenzy by DreamWarrior. Sometimes it’s the unusual patterns that make the best images and this is no exception creating a charming, mid-century style fabric for a dress. 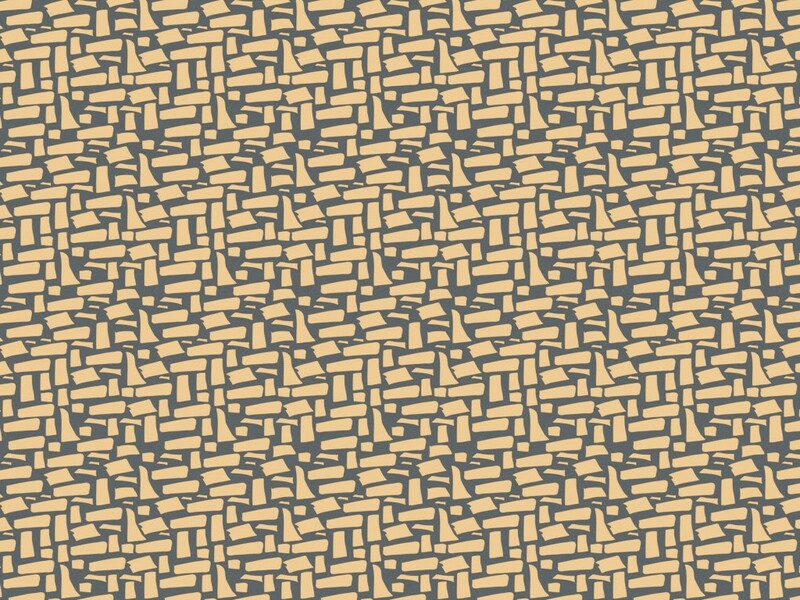 Created with a typical mid-century design, this is shown here in two swatches, a light and a darker background, and made up into one image. The dress is the Paige dress, which is a 1960s style, and the model is a Genesis 2 character from Daz. 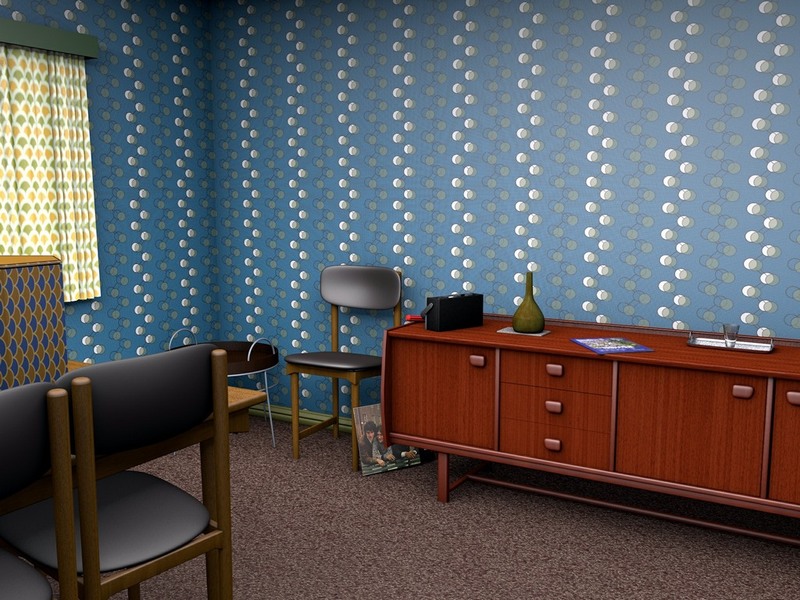 The render was made in Daz 4.7 Studio and the pattern created in Adobe Illustrator. As I promised yesterday, this is a much more extreme version of the same pattern and meant to represent the excesses of the early 1970s (of which I was a part). Having rendered it (there are still some anti-aliasing issues to deal with) I found that I quite liked it: where I thought I would find it too bizarre, I, in fact, found it very palatable. Perhaps this is an example of the design showing through, I don’t know.